An incredibly diverse range of acts and attractions means that throughout the day, a non-stop mix of action and amusement showcases some of the most prodigious talent and potent machinery ever to be gathered in one place. 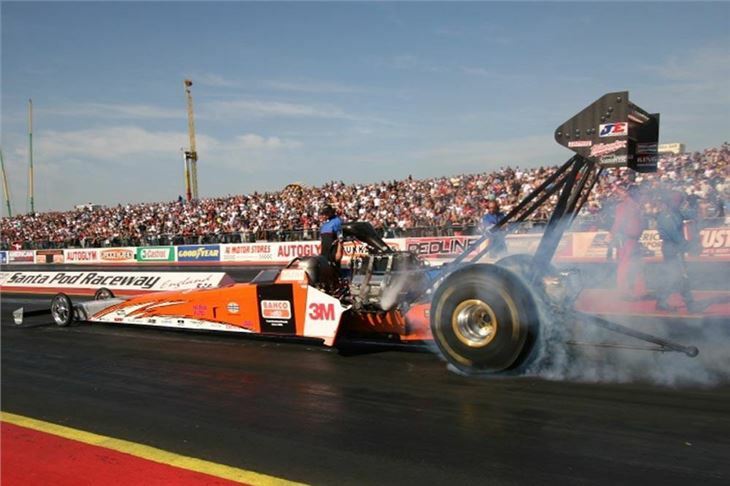 True race fans and petrolheads will delight in the 8,000 horsepower Top Fuel dragster and a Nitro-fuelled Funny Car that will be pounding the strip throughout the day, as well as the World's fastest Jet-powered race cars. These madmen strap themselves to over 10,000 horsepower of afterburning jet engine to cover the quarter mile in just over 5 seconds, at a shade under 300mph. Not for the faint hearted! Equally impressive and almost as loud is the Live Action Arena where the car-crushing talents of Santa Pod's resident Monster Truck, Podzilla as well as Swamp Thing vying for attention alongside multiple Guinness World Record holder Terry Grant and his incredible stunt show. Mix in UKFMX, Britain's best Freestyle Motocross team and leading quad bike showman Jason Smythe - and you've got the ingredients for a superb show. Music fans will delight at the headline signing of 'Here Comes The Girls!'. The superb tribute act tips its hat at acts like Lady Gaga, Cheryl Cole and The Saturdays. As easy on the eye as they are on the ear, this is one superb show that ticks all the boxes for fans of all ages. One for the ladies, James Sutton, better known as Ryan from Emmerdale, will also be at the show, meeting his fans and signing autographs. From the sublime - to the ridiculous, ace car builder Perry Watkins will also be showcasing 'The Flatmobile' the World's lowest car - and 'Wind Up' the World's smallest vehicle. His 130 mph table and chairs, better known as 'Fast Food' will also be gracing the strip. Titan, the amazing 8 foot tall interactive robot will be walking amongst the crowd, delighting and terrifying in equal measure. The Black Knights Parachute Display Team will also be quite literally 'dropping in' later in the day with their unique display of skill and control, and if that wasn't enough, Mark Jefferies will be putting on a stunning aerobatic display. But there's still more!, Drifting demos, Kids Entertainers and even a full funfair. Or why not take a pleasure flight in a helicopter and see the whole lot from the air? Or strap yourself into a genuine 2 seater dragster and blast up the quarter mile in a shade over 7 seconds! But of course, it wouldn't be Flame and Thunder without a spectacular firework display and huge bonfire - and this year, the Santa Pod team have really pulled out the stops to create a memorable evening. As the light dims, a fully sequenced firework display will delight the crowd. With under 16s getting in for free, advance tickets starting at just £17 and more acts and attractions in one day than most show goers see in a whole year, it's the essential family day out of 2010! Just don't forget your hat and coat!